The Sheep Whisperer: The "Mamba" that isn't a Dance! The Black Mamba strikes fear in the hearts of many living in its domain. 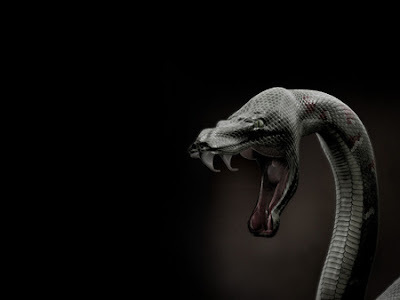 It is one of the deadliest snakes on the planet, able to kill a human being with one venomous bite in a total of 20 minutes. That was the story from Africa, prior to the discovery of an anti-venom for the Black Mamba, which has slightly increased the odds of survival. I can be very aggressive if Ewe dare to corner me! Some people consider me the most dangerous creature on the planet! 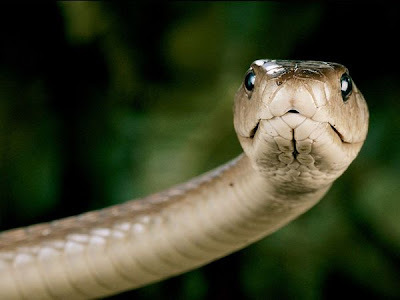 In some circles, the Black Mamba is considered he most poisonous snake in the world! If Ewe have the misfortune of being bitten by a Black Mamba, pray, because Ewe have a 75 - 100% mortality rate. 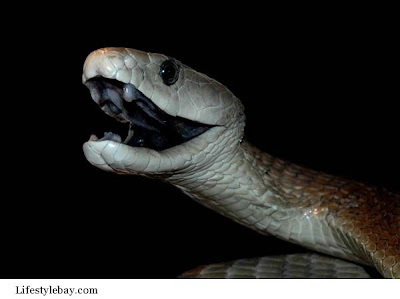 The venom of a Black Mamba contains potent neurotoxins & cardio-toxins which are lethal. They are shy & try to avoid confrontation, however, if Ewe persist in attacking them, Ewe will be sorry. They will raise their heads with one third of their long bodies off the ground, & will proceed to strike Ewe repeatedly, injecting their deadly venom with each strike. 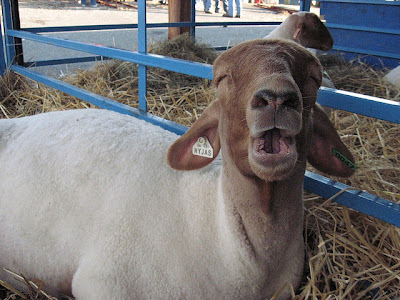 When Ewe see the "Black-Blue" on the inside of my mouth, it's too late for Ewe! Black Mambas live in the savannahs & rocky hills of southern & eastern Africa, & don't get their name from their skin color, which tends to be grey or olive colored. 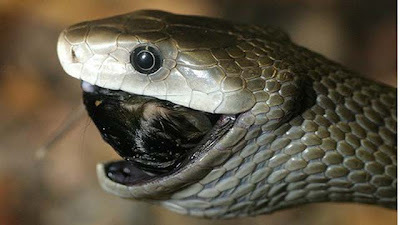 They're named from the blue-black color of the inside of their mouth , which they put on display when threatened. 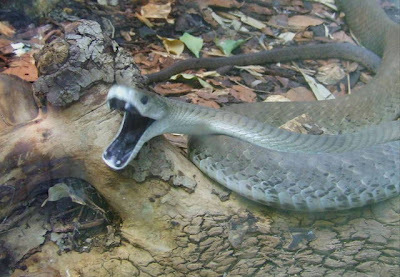 Black Mambas are Africa's longest venomous snake, measuring up to 14 feet in length! The average length of a Black Mamba is 8.2 feet, which is still quite significant. Besides being long, the Black Mamba is also fast, slithering at speeds of 12.5 mph, which labels it as one of the fastest snakes in the world! As long as my mouth is closed, Ewe are safe! 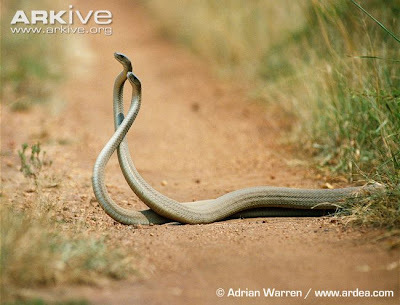 A pair of Black Mambas doing the "Mamba"! Do Ewe understand that " Visiting Hours are OVER!" Sheep are not fast & are not poisonous like the Black Mamba. Their only claim to fame, is that of all domestic animals, they are the domestic animal that needs the most direction, guidance, & care. 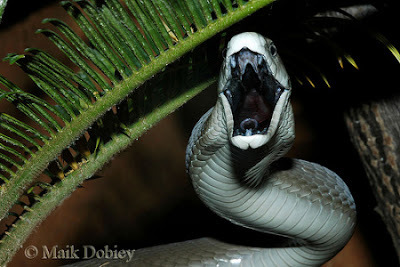 Although they are nervous & shy like the Black Mamba, they have no lethal bite to inject into their attackers. The only defense they possess is the courageous protection offered by the Shepherd. Look at me & tell me if I'm not the "Neediest" animal Ewe have ever seen! We live in a dangerous world & it's comforting to know that as a Sheep, we don't have to travel on the path of life alone. Blessings!